GOMA, Democratic Republic of Congo -- Some tourists were kidnapped and a convoy attacked in the Virunga National Park, the Democratic Republic of Congo's famed haven for gorillas and other endangered species, a park source said. The source did not specify the nationality of those abducted but said their guard was seriously injured. A local journalist also tweeted about the kidnapping. "I confirm an attack on our convoy," Joel Wengamulay, the park spokesman told AFP, without specifying if tourists were targeted or had been kidnapped. Separately Voice of America reported that one park ranger had been killed and two foreign tourists and their driver were missing. Those details were unconfirmed. British media reported that two U.K. nationals had been abducted, and the British Foreign Office confirmed that it was "in close contact with the authorities in Democratic Republic of the Congo following an incident involving two British nationals," according to the Reuters news agency. On April 9, five rangers and a driver were killed in an ambush in the park, which was established in 1925. 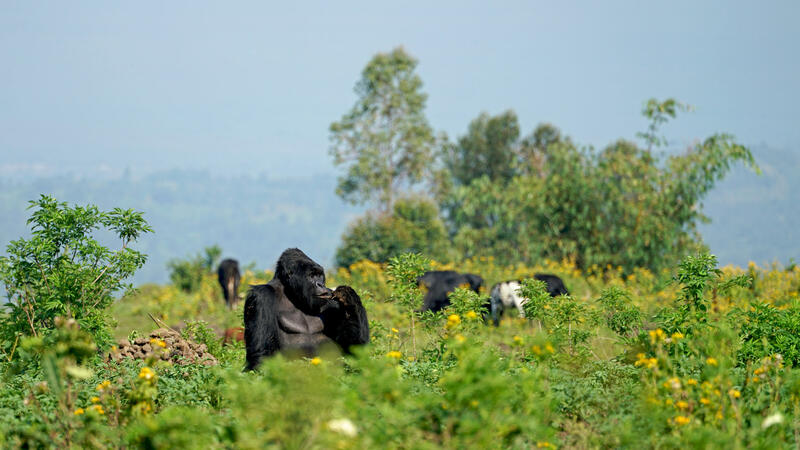 One of the most important conservation sites in the world, it covers 7,800 square kilometres (3,011 miles), or three times the size of Luxembourg, along a swathe of eastern DR Congo abutting the border with Uganda and Rwanda. Virunga is home to about a quarter of the world's population of critically-endangered mountain gorillas, as well as to eastern lowland gorillas, chimpanzees, okapis, lions, elephants and hippos.